Welcome to the website of the Nanomaterials for Optoelectronics (NMOE) research group led by Prof. Dr. J. Zaumseil at the Chair of Applied Physical Chemistry at the University of Heidelberg. We are an interdisciplinary research group of chemists, physicists and engineers and have recently moved here from the FAU Erlangen-Nürnberg. 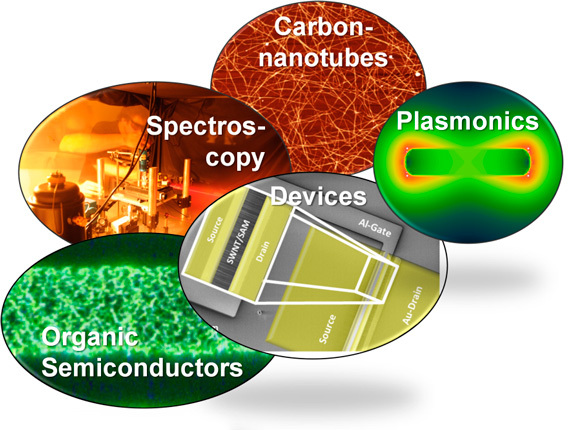 We are interested in unconventional, solution-processable semiconductors such as single-walled carbon nanotubes, conjugated polymers and quantum dots. We investigate their charge transport properties as well as light-matter interaction (e.g. electroluminescence) with a wide range of experimental techniques. Have a look at our research page for more details.